Though we were not alive in the past when people who were members of our history participated in atrocities, wrongs, discrimination, genocide, etc., do we have a role in how past wrongs affect our collective future? Can we change the impact the past will have on the future by what we do today? Are there places in our world today where we can effect reconciliation and/or help to bring healing? What impact does healing our past have on us personally and collectively? What does working for healing say about us as individuals and as a society? The social action assignment requires students to recognize injustice, explain its impact, devise an action plan and document the results of actions taken. The beginning of this study focuses on the ancient cultural history of the Northern Great Plains. The region has been continually occupied for more than 12,000 years, with over 30 different tribes maintaining culturally significant ties to the area until today, 2014. A multicultural review of the history of the Medicine Wheel Country will be outlined for students. This geographic overview will include an analysis of maps and other forms of multi-media that provide information and context for both tribal oral histories of the region, as well as the most significant archaeological discoveries there. With no domesticated animals and no adequate climatic conditions for reliable crop agriculture, the tribal people who shared in this area thrived as hunters and gatherers of abundant wild plants. Everything and everyone must have a place, and as the old saying goes, there’s no place like home; home is where the heart is. Our home, and by association, our homeland, is a place that we belong to; a place that we come to reflect in more ways than one. All around the world, on every continent except for Antarctica, human beings have had to learn about their place in order to survive and thrive. Human cultures are always shaped and influenced by places where people live; such as ancient Hawaiians eating lots of fish and inventing surfing, or the Inuit of Alaska living in igloos during the winter and inventing sunglasses. The Great Plains of Montana is a unique place for many reasons, and the culture that was developed by tribal people there over many thousands of years is just as unique. This was the home of the ones in the breech cloth, who hunted buffalo and lived in tipis; the people who practiced the Sun Dance ceremony, and counted coups in battle. This was their home, and the heart of it could be found at the Big Horn Medicine Wheel; there is no other man-made structure that better symbolizes the buffalo hunters of the Northern Plains. Places can be both simple and obvious, as well as complex and mysterious. In fact, all places inherently maintain all of those qualities at once, and in the case of the Medicine Wheel, those qualities are on vivid display. While there are many mysteries about the wheel that may not ever be revealed, including who built it and why, there are many things that are known and are still being discovered about the wheel. Most tribal cultural authorities throughout the northern Plains have said that the Medicine Wheel is the physical basis for the most famous and unique Northern Plains ceremony – the Sun Dance. 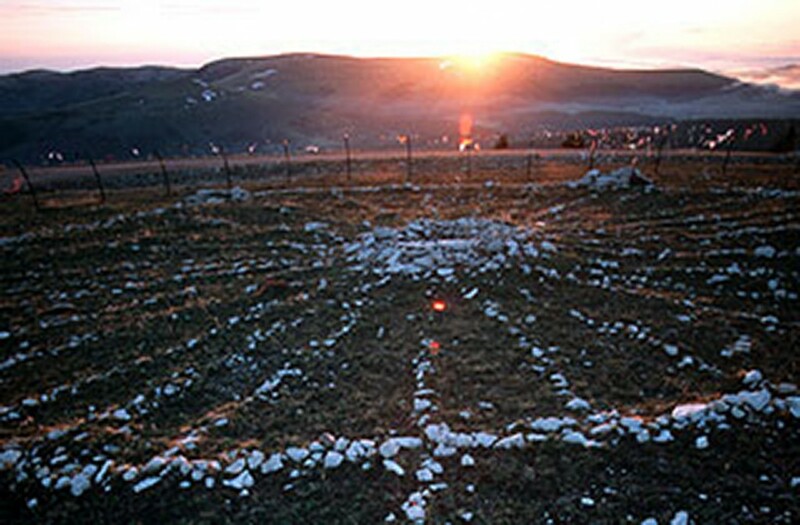 Scientists who continue to research the wheel have discovered that it can be utilized as a functional calendar for daily and nightly observations under the big Montana sky, as the 27 rock lines that extend outward from the center of the wheel can be aligned with numerous celestial bodies, including the rising sun on the shortest and longest day of the year. Archaeologists have identified 70 different types of Medicine Wheel stone structures in the northern Plains, but the most famous and symbolic is the Big Horn Medicine Wheel, which is located high on a 9,000 foot plateau in the Big Horn Mountains; a profoundly beautiful and sacred site either with, or without the wheel upon it. Standing on top of Medicine Mountain, overlooking thousands of square miles of land in every direction, several popular monikers for the region come to mind, including “Big Sky Country,” “Yellowstone Country,” “The Last Best Place,” and the popular term in my tribal community “Crow Country,” but “Medicine Wheel Country” is the only name that truly resonates from that place, so it’s the title I like to use when referring to my homeland. To me, the Medicine Wheel stone structure is at the heart of the northern Plains way of life, and it belongs to anyone who respects it and the balance it represents. The Medicine Wheels that are found throughout the northern Plains are not all designed the same way, but they all share the same basic form that embodies the Plains Indian worldview and way of life. The Wheel provided the northern Plains tribes like the Shoshone, Blackfeet, Kootenai and Cree, with an all-purpose tool for their way of life. Since time immemorial, tribal people lived in a seasonal cycle on the northern Plains, moving their lodges from winter encampments along woody and sheltered river bottoms, to higher grounds in the spring and summer. Surviving as hunters and gatherers, northern Plains people spent 7-9 months of the year living in wind-protected winter campsites, staying close to the running water and Cottonwood trees. When the summer brought green grass, Grizzly bears and mosquitos back to the river, Plains Indians moved their lodges away from these high amenity zones and spent the long summer days hunting and gathering wild plants, traversing the land via ancient trail systems, and trading with adjacent tribal members and neighboring tribes. Thousands of years before modern horses came onto the Great Plains, tribal people maintained disciplined and successful lives based on this seasonal and circular movement. Always either moving or staying with every natural element in mind, Plains Indians were the masters of their domain because they accepted the rules of living in their harsh homeland, and knew as much about what not to do, as about what to do. Understanding how Montana’s dry climate affected material goods allowed tribal people to make use of animal skins for dwellings and clothing, and it also allowed for the drying of meat and other foods for long-term storage. The arid environment and clear, open sky also made for crystal clear nights, which made star stories a nightly occurrence. This constant connection to the night sky kept tribal people in constant tune with the sacred hoop of the seasons, knowing when to move camp, when to harvest wild foods, and when to stay put. Living in a systematic and ceremonial manner, Plains Indians were never truly nomadic, as their seasonal movements were always planned and predicated on scientifically based knowledge that was passed down generationally through a sophisticated oral tradition. Over 2,500 years ago, tribal people throughout North and South America were growing corn, beans, squash and potatoes. The ancestors of many modern Plains tribes were living in the Mississippi River Valley and helping to develop an enormous agrarian society that became world famous for their hundred foot high earthen mounds. However, in Medicine Wheel Country, the harsh environment and plentiful population of wild foods led the people to abandon the prospects of becoming farmers. Tremendous amounts of nutritious wild plant products, such as roots, herbs, and fruit, and huge populations of wild big-game animals, such as bison, elk, deer and moose led the people to abandon the prospects of becoming farmers and instead continue their ancient way of life in a bountiful, but often extreme place. The Medicine Wheel also provided tribes with the perfect ceremony for their place in time and space: The Sun Dance. This ceremony is only practiced on the Great Plains, and the extreme nature of its’ rituals, including sacrificing one’s own food and water for 3-4 days and nights in the hot sun, reflect and embody the very nature of the northern Plains: An unpredictable place of bitter cold and scorching heat, where only the hardiest of people, plants, and animals could survive throughout the year. The beautiful and strong nature of Northern Plains ceremonial traditions, such as the personal fast (aka, the vision quest), the Sun Dance, and the Sweat Lodge, just to name a few, provided individuals and communities with the power they needed to thrive within their lives in every way. The ceremonial traditions of the people who lived in the Medicine Wheel Country embodied the value of a balanced life, just as the wheel symbolizes balance and wholeness. The four directions of the Wheel also represent the four seasons, the four winds, and the four colors. The sacred number four that symbolizes a complete circle is the basic number that accompanies every ceremony, including the Sun Dance, and it reminds tribal people of the full circles of process that we must acknowledge and respect in life. Circular cycles that define the natural processes of life, such as birth, youth, adulthood and old age, are realities that we must recognize and come to terms with. The Sun Dance tradition teaches us many things about ourselves, and about the landscape from which it originated; a land of sun and stars whose cold winds and drought cannot be tamed or changed by man or machines. The Medicine Wheel teaches us how to balance ourselves with nature, and accept and embrace each day, no matter the weather. Beyond its’ economic and ceremonial significance, the Wheel also reflects the cultural crossroads that the Great Plains has always been, and continues to be. One example of how the Medicine Wheel Country is a cultural crossroads is the remarkable creation and spread of Plains Indian Sign Language (PSL), which is estimated to be spoken by over 40 different tribes, from Canada to Texas. This PSL (Plains Sign Language) is still known and spoken by some tribal people today, and it has its roots in the open land of the Great Plains, where it’s often easy to see for many miles in all directions. Understanding this sign language requires that a person is always conscious of the four cardinal directions, and therefore always conscious of what direction they are facing; it is only within this context that PSL can make sense and be intelligible. In this way, Plains Indians carried the Medicine Wheel in their minds at all times, using this basic wheel to communicate with the world, always knowing their exact location within the center of the circle. Whichever direction they may have come from to venture onto the Plains tribal people understood that this was a great landscape shared by many diverse tribes who valued communication, trade, friendship and alliances; PSL was the language that allowed all of those things to occur. Plains Indian music and dance are also the art from Medicine Wheel Country. Plains Indian pow-wows, which are commonly held throughout the U.S. and Canada, are held within a circle, with dancers moving around the arena in a clockwise fashion, following the path of the sun. The songs themselves are sung by singers who form a circle around a drum, which is the heartbeat of the Plains nations, and provide a style of song that is meant fill up the open spaces of the Great Plains. Difficult to describe and even harder to write down as music, the powerful songs of the northern Plains have come to represent tribal music across North America, yet few people realize that the songs themselves come from the same cultural zone. Like Plains Sign Language, music and dance are a form of communication that goes beyond the spoken word, and are able to convey meaning and celebrate life in ways that words are unable to do. Like all of the other cultural creations of the Medicine Wheel Country, these traditions are held and practiced in balance within the sacred hoop of life. Some of my earliest memories of the Medicine Wheel are of when I was a little boy, standing in the sunlight and cold wind and feeling the reverence of the place while my uncle and his friends conducted prayer ceremonies. My cousins and I enjoyed the amazing beauty of that place, and I can still remember the feeling of being at the top of the world. When I return to the Wheel today as an adult, I still feel the same humbling and comforting feeling I had back then; a sense of being in a sacred place, at home in the center of my tribal homeland. Looking north, west and east from the Wheel, the views stretch for hundreds of miles, with the distant horizon fading into space. This is the place where people have come for thousands of years to pray for renewal and give thanks for their continued life. I believe that if we continue to go to the Wheel for inspiration and protect that place for many more thousands of years to come, then it will continue to be a conduit for wisdom and ceremony, and it will continue to help guide life in the land of extremes: land of the wild and home of the patient. The most important aspect of the ceremonies based upon the Medicine Wheel are the healing qualities that they offer to people and to the earth. Healing through prayer offers a continuous path to spiritual renewal and leads to overall community health and well-being. All of the tribal people in the Americas have suffered tremendous trauma since before the time of Lewis and Clark, as European diseases shattered their societies by decimating their population. This initial loss of life was only the beginning of the devastation dealt to tribal communities, as they also lost wars to protect their homelands, and then suffered from colonial destruction such as forced boarding schools. All of this trauma has been inherited by today’s generations of American Indians, so there is a great desire in modern tribal communities to heal and become whole once again, as individuals and as nations. There have been many changes in the land and in the people during the 200 years since Lewis and Clark first traveled through the Medicine Wheel Country, and many people throughout the state and nation believe that the time has come for healing. Inter-cultural healing between and among the people who have inherited their ancestors’ misunderstandings and misgivings often requires coming together for ceremony. This first part of our journey through the Big Sky Country will focus on some ways that modern people are coming together to acknowledge past cultural trespasses and reconcile for today and for the future. The first point on this journey begins 12,500 years ago, with a family tragedy in the heart of the Medicine Wheel Country, and comes full circle during the summer of 2014, with a burial ceremony to honor a sacred site disturbed. Within this 12,500 year old circle, is a much smaller, but equally as important journey of healing between the colonial powers of the U.S. Government and Tribal Nations along the Lewis and Clark Trail. As learners, we will follow these two monumental paths of healing, and we will simultaneously travel our own path of healing between our previous understandings and our newfound consciousness. Ask students what they know about Medicine Wheels. Record their current thinking on the board. Read through the narrative provided for students above. If you have a class that needs a focal point while listening, ask students to jot down new things they hear that they did not know before. Though we were not alive in the past when people who were members of our history participated in atrocities, wrongs, discrimination, genocide, etc. do we have a role in how past wrongs affect our collective future? Can we change the impact the past will have on the future by what we do today? Are there places in our world today where we can effect reconciliation and/or help to bring healing? What impact does healing our past have on us personally and collectively? What does working for healing say about us as individuals and as a society? Forty years ago a family found the remains of a two-year-old child in their backyard. Over the next 40 years scientists would work to uncover the identity of this child. In 2014 geneticists found that the boy’s remains were 12,500 years old and that he is the ancestor to 80-90% of the American Indians in North and South America. Following this discovery, people involved with the research are working to strengthen the relationship between scientists (who have a track record of misusing American Indian remains for scientific purposes and for ignoring the wishes of tribal people regarding these remains) and tribes by collaborating with Montana tribes to rebury the child’s remains. Read the Anzick article. Discuss how the groups are seeking healing and what specific actions are being taken. What impact does reburying the child’s remains have on the relationship between American Indian people and scientists? Why do some American Indians want the child to be reburied? Why do some scientists want to rebury the child and others do not? (Some scientists fear that if the child is reburied and scientific advancements allow us to gain more information from the bones they will not be able to study them further.) If this child was a relative of yours, do you think scientists should be able to keep the body in case they may be able to study it further or do you think they should respect the burial your family had for the child? Should some cultural values be able to pervade over others? What impact does using the reburial of the child to promote healing have on the future of specific individuals involved and also on the future of our society as a whole? Did the person involved do anything to put it right in words and actions? What might be the lasting results from this situation? What could be done about these long-term effects? Does this happen in other situations? What can we do? Examine the New York Times Portraits of Reconciliation (Rawanda). Place students into pairs and give each pair one of the portraits and its associated quotes. Ask the students to look at the quotes from the perpetrator and the victim. What do these words teach us about saying sorry and doing sorry? What impact is saying and doing sorry having on this cultural tragedy? How might the future be changed as result of these actions? Allow each pair to summarize their discussion for the class. View Judith Thompson on the value of evolving narratives. Consider the role we play as members of a culture—Is saying “sorry” enough or must we also “do sorry”? Encourage student to take notes while listening. What information from these clips do you think applies to you personally? Allow student to engage in small group discussions about this question. When you look at the world around you, do you see any injustice? If there is injustice, what actions do you think would heal the situation? As a student, what can you do to begin healing this injustice? As your culminating assignment (students could do this as a class, as a small group, or as individuals), research one significant injustice you see in your world that you believe needs healing. Write a one-page explanation of the injustice explaining who is harmed, who has done the harming, and the impact this injustice has on those harmed AND on society or the community as a whole. Follow this writing with a one-page action plan explaining the steps you propose to begin bringing healing to this injustice. Be sure to explain what specific actions will be taken, who will take them, and the results you think will come out of the action. Finally, put your plan into action and devise a way to preserve what happens. Make a video documentary, create a piece of art, write a poem or song, create a photo documentary, etc. Whatever you create to illustrate your results should show to others what the impact of your action was on the healing process. Even if your actions don’t have the result you expect, it’s ok to try and then to present your results and discuss the outcomes so we can learn more about humanity from the work you did. Struggling learners may be a great asset to this assignment as they may have experienced/felt injustice and feel passionately about its wrongness. Every student should be allowed to contribute ideas of injustice to the discussion. Struggling learns can then be assisted in developing the action plan by talking through their idea with the teacher or a classroom aide. The teacher/aide can then help the student to break the plan down into doable steps and help the student decide a way to document the action that is accessible. Small group work on this assignment may also allow the student to demonstrate leadership with ideas and then work with others on the development of the plan. Sometimes injustice can seem like a very abstract idea that is hard to get a hold on. Students may also sometimes feel overwhelmed by the idea of finding a way to heal these wrongs. It may be most helpful in these cases to simplify the concepts by personalizing them. Think of a time when you felt something happened to you that was wrong or unfair. In what ways were you hurt by what happened? Is there anything that could help heal or begin the healing of this hurt? Once when we were coaching basketball, an angry parent came down and yelled at my wife. She said a lot of mean things and embarrassed my wife in front of a gym full of people. The Apsáalooke people have a belief that if someone is insulted or hurt by another person, someone should give them a gift(s) to restore them and help them heal. The gift doesn’t have to be given by the person who did the hurting. When someone gives the gift, it says the person is cared for and that others recognize that a wrong was committed. After that parent yelled at my wife, her grandmother came down from the bleachers and unwrapped a bundle from her purse. Inside was a very old, beautiful purple necklace. All she said was, “I think this would look good on you,” but the people looking on understood that it was a gift to restore her because she had been hurt. This is an example from my life where someone experienced an injustice and someone took an action to bring healing. Advanced learners may benefit from a deeper analysis of how injustice impacts communities and societies. Introduce advanced students to the Owning Up Curriculum. This provides students with tools to strengthen their sense of agency (their ability to believe that they can take actions that will make a difference). Many gifted children are deeply impacted by social wrongs, but are often left feeling hopeless or frustrated because of their perceived inability to act on their feelings. Thus, learning about tools that allow them to act is very motivating and they should be able to take on this curriculum on their own without a great deal of direction from the teacher. However, the teacher should have a discussion with advanced students about what they would like to do with their new tools and help them to devise an appropriate project. Advanced learners may also read additional books about topics of injustice. The Sweetgrass Basket and To Remain an Indian are both good books that explain the trauma of boarding school. The first book is a story, the second book is more technically challenging. There are a number of actions happening in Native communities to heal the wounds of boarding school wrongs that students could research. It might also be valuable for advanced students to research issues of human rights. For instance, they might read and analyze the United Nations Declaration on the Rights of Indigenous Peoples. The Owning Up Curriculum, written and developed by Rosalind Wiseman, author of The New York Times bestseller Queen Bees and Wannabes, provides a structured program for teaching students to own up and take responsibility—as perpetrators, bystanders, and targets—for unethical behavior. The curriculum is designed for adolescent groups in schools and other settings. The Owning Up Curriculum presents a unique and comprehensive approach to preventing youth violence by targeting the root causes of bullying and other forms of social cruelty. It exposes the cultural expectations that teach young people to humiliate and dehumanize others as the way to achieve power and respect, then challenges them to transform this dynamic. The program also addresses the nuanced ways in which racism, classism, and homophobia are expressed in our culture and affect social cruelty and violence. Sweetgrass Basket by Marlene Carvell. (2005) Published by Dutton Children’s Books. To Remain an Indian by Lomawiama and McCarty. (2006) Published by Teachers College, Colombia University. The UN Declaration on the Right of Indigenous Peoples would be considered a primary source.